Start your review of Nick Abou Ghouche. Send a message to Nick Abou Ghouche. Thank You! 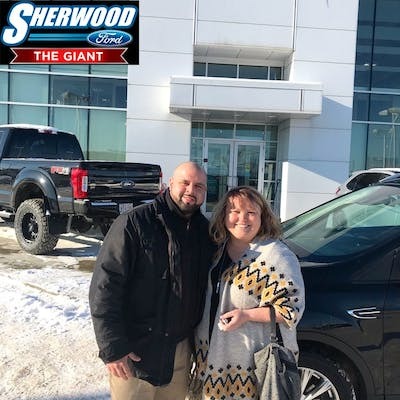 Your message has been sent to Nick Abou Ghouche at Sherwood Ford. Thanks Ernesto! Love my new Ford! 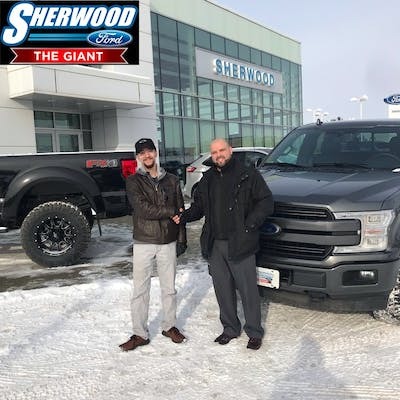 Would definitely recommend Ernesto and Sherwood Ford for your next vehicle purchase! Transaction was easy and staff all very friendly! "Excellent service, as always. " Quick, simple, pressure free, and with no extra strings. I've been to Sherwood before, and will certainly be returning in the future. Their service standards are excellent, and should be a model for others. "The employees were all very helpful,Knowledgabl and friendly"
The staff had great patients with us and answered all our questions to our satisfaction. Thanks Wally, you were a pleasure in assisting us in the purchase of our new truck. Thank you !!! thanks to Nestor Bernal and Nick (Manager) for their valuable help and attention, their services are excellent, 100% recommended. quality, service and price! FORD the best. "Great experience. Would recommend "
Esky was very professional and easy to deal with. I feel he went above and beyond to get the deal done for me that I felt comfortable with. I will definitely consider buying another vehicle from Esky in the future. I feel the whole dealership made my experience an excellent one. and very injoyable. "A great experience with Tom and Nick!" 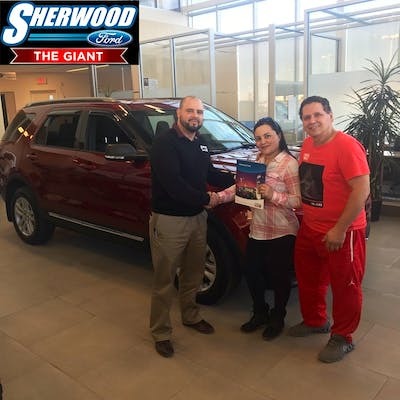 I went into Sherwood Ford and had the fortune of having a special purchasing plan through work. Although I had that, we still had to deal with our trades and had to deal with financing and picking the right vehicles for my wife and I. Immediately, we were greeted by Tom, one of the salesmen, who was helpful throughout the entire process. On the first night there, we ended up staying about an hour past their closing time, making sure the paperwork was done for my new truck. We returned the next day and spent another 4 hours (Another 30 mins past close) to get my wife's Escape picked out. This wasn't an easy thing to do! We test drove 3 or 4 Escapes and looked at 7 or 8 in total. Throughout both days, we constantly apologized to Tom and Nick, who told us not to apologize and that we were not in their way or taking away from their home time. In the end, Nick found us the Escape that was perfect for my wife, at another dealership, and brought it in. A couple of days later we were both driving off with our new vehicles, happy and having had a great experience at Sherwood Ford! 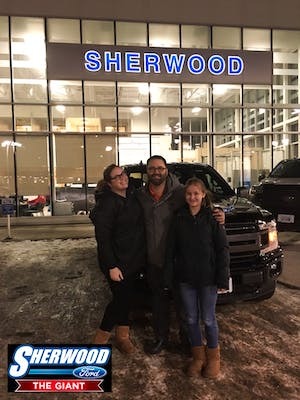 So pleased with the service we received at Sherwood Ford. Tom in sales was amazing to work with and provided excellent customer service. He listened to exactly what our wants and needs in a vehicle were and with the help of Nick- delivered all that and more. Thank you so much for the shopping and purchasing experience- we could not say more positive things. Would recommend Tom, Nick and Sherwood Ford to all our friends and family. "5 star service across the board! " 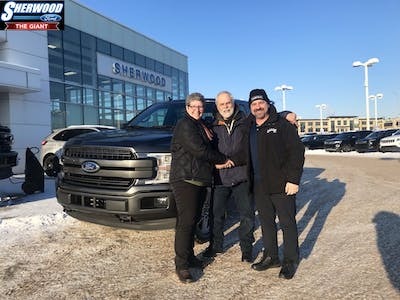 "Zeno is the best and Sherwood Ford is great." Zeno went out of his way to get us a good deal on our new truck. We were so lucky dealing with him. He made sure his manager knew we wanted a new truck and the price we were willing to pay. Zeno also worked with Rob, the finance manager, to get us good pricing on our extras, like undercoating, paint protection and our maintenance package. Thank you.